Esperienze sui Movimento del Cervello nell'Uomo. Torino : Vincenzo Bona, 1876. Description :  pl.,  p., 34 p.,  l. ; ill., 1 photo., 2 fold. graphs ; 23 cm. Photograph : mounted cabinet card on fly leaf. Subject : Physiology — Brain. Photographer : Michele Rondoni (Fotografia Alfieri). [In Ludwig's laboratory, Mosso] received the decisive influences which later shaped his entire career. The researches of Mosso with the plethysmograph have shown that not only the heart, but the entire circulatory system, forms a sort of sounding-board, which every change of our consciousness, however slight, may make reverberate. Hardly a sensation comes to us without sending waves of alternate constriction and dilatation down the arteries of our arms. Bound together with : Mosso, A., Introduzione ad una serie di esperienze sui movimento del cervello nell'uomo. Scarce, one copy found at Univ of Chicago. Dedication copy inscribed by Mosso to C. Ludwig "in treuer Dankbarkeit. Weihnachtabend 1876." Extract from Archivio per le Scienze Mediche, anno I, fasc. 3°, 1876. Fine binding with blind stamping and ornamental gold stamped monogram, "C. L."
Photo size : 10 cm. x 13.6 cm. One of the most significant advances in 19th century medicine was the coupling of instrumentation and scientific graphing. This led to the invention by Carl Ludwig of the kymograph in 1846. Using a stylus on a rotating drum, the kymograph recorded the blood pressure readings from Poiseuille's tube inserted in an artery. In 1854, Karl von Vierordt established that blood pressure could be measured topically by the amount of pressure required to obliterate the pulse and he invented the sphygmograph to record his measurements. However, the Vierordt sphygmograph was impractical until Étienne-Jules Marey made dramatic improvements in 1860, reducing it from a cumbersome parlor piece to a device that could be strapped to the wrist. The Marey tambour which measures subtle physiological movement was his next invention, and both devices were used by Marey and Auguste Chauveau in 1861 to identify ventricular contraction in the pulse. Marey's instruments and Ludwig's kymograph led to numerous variant apparati adapted to other physiological measurements such as Mosso's plethysmograph first described here and later perfected into the electroencephelogram by Hans Berger. Non ritorneremo sulle ricerche che vennero fatte con un metodo analogo da Buisson1, da uno di noi e dal dottor Franck ; per ora basta ricordare che chiudendo l'antibraccio della nostra donna in un cilindro di vetro pieno di acqua tiepida ed/applicando ad un'apertura del medesimo un timpano a leva si ottengono tracciati del tutto identici a quelli che si hanno registrando i movimenti del cervello sulla breccia del cranio. Le curve scritte da due organi tanto differenti hanno la più completa rassomiglianza con quelle della pressione del sangue che L u d w i g pubblicava per la prima volta quando introduceva nella fisiologia il suo chimografo registratore. — page 11. Mosso and Giacomini begin their paper with the review of a device improvised by Brun in 1866 2 for measuring the movements of the brain. Brun's instrument was a simple lever attached to a cork that was pressed against the dura mater. They also review similar attempts by Leyden 3 who used a version of Ludwig's kymograph in 1866 and Langlet 4 who adapted Marey's sphygmograph and attached it to the fontanelles of sleeping newborns with limited success. Giacomini and Mosso got better results with the Marey Tambour which they attached to their patient "Caterina X.," a 37 year old peasant woman who was dying from a syphilitic infection incepted from her husband while she was pregnant with her sixth child. 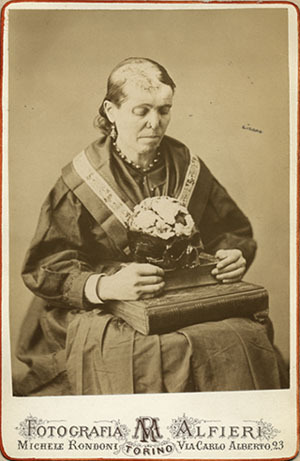 She recovered, but her baby died two years later in 1868 and the disease remanifested shortly thereafter as chronic frontal headaches and ulcerating tumors over much of her body. Caterina's health continued to degrade until June 22, 1875 when she was admitted into the syphilis clinic of San Lazzaro hospital for the third time. By this date a massive gumma had destroyed portions of her frontal and parietal bones and operations commenced to remove necrotic bone. Mosso and Gioacomini applied Marey's tambour to the exposed dura mater and made their first tracings on January 11, 1875. They also inserted Caterina's arm into Mosso's plethysmograph, a sealed glass tube filled with lukewarm water and affixed to another Marey tambour and recorder. With this device they were able to make tracings of volumetric changes in the arm that were simultaneous to the brain and respiratory tracings. 1. Buisson, Thèse inaugurale ; Paris, 1862. 2. Bruns, V., Die chirurgischen Krankeiten und Verletzungen des Gehirns und seiner Umhüllungen ; Tubingen, 1854, page 601. 3. Leiden, E., Beiträge und Untersuchungen zur Physiologie und Pathologie des Gehirns ; Virchow's Archiv., v. 37. 1866, p. 519. 4. Langlet, J. B., Étude critique sur quelques points de la physiologie du sommeil ; Paris, 1872.